Many individuals who have no teeth in one or both jaws find removable dentures an economical way to restore their smiles. Yet dentures are not always so easy to wear. Sometimes they slip when you try to eat or speak. It happens more often with a lower denture, which can easily become dislodged by the tongue — a more powerful muscle than you might think. A loose denture can make you feel self-conscious, and prevent you from eating a nutritious diet. Removable dentures will also cause bone loss in the jaw over time by pressing down on the bony ridges that formerly supported the teeth. Fortunately, there's a simple way to prevent all of these problems: supporting your removable dentures with dental implants. You may have heard about dental implants acting as lifelike replacements for individual missing teeth, and that's certainly of great benefit to those who still have many of their natural teeth. But when you have no teeth left in one or both jaws, putting in a dental implant for every tooth is not economically feasible, nor is it necessarily desirable. An excellent solution is simply to place as few as two dental implants in the lower jaw to support a removable denture so that it does not come loose when worn. 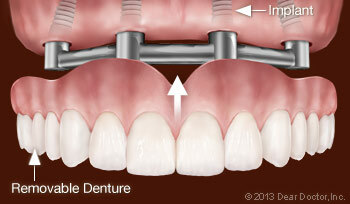 An implant-supported removable denture can — and should — still be taken out for cleaning and maintenance. Dental implants are small titanium posts that serve the same purpose as the roots of natural teeth: They anchor replacement teeth to your jawbone. Like natural tooth roots, they lie beneath the gum line and are therefore not visible in the mouth. 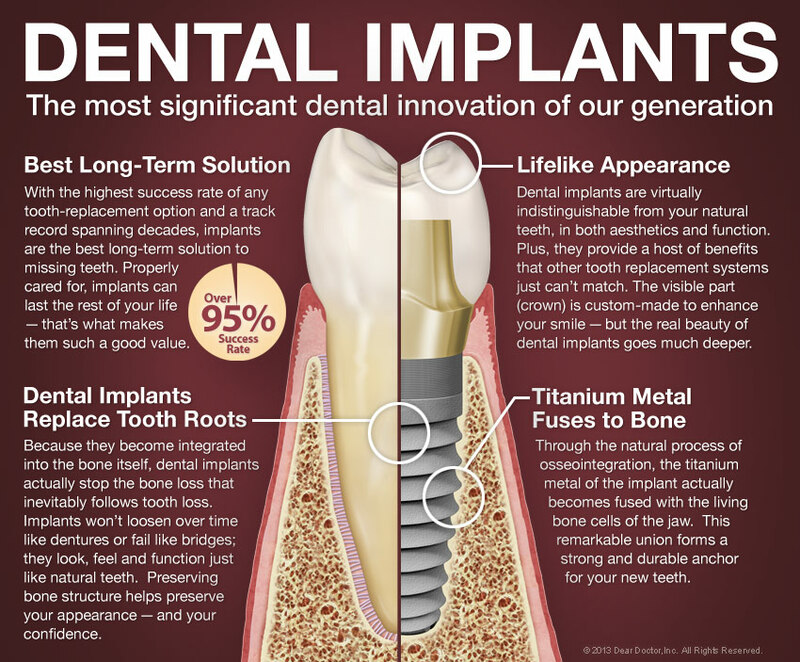 Because titanium has the unique ability to fuse to living bone, your dental implants actually become a part of your jawbone and help to preserve its volume and density — an important consideration for your health and appearance (Learn More). When a denture is secured by implants, it does not press down on your bone tissue in a destructive way, and it will remain in position as you eat, speak and smile. This has a very positive impact on quality of life. It usually takes only two implants to support a lower denture, though every individual is unique and we will have to examine you to determine what would work best in your case. Retaining an upper denture requires a greater number of implants, usually a minimum of four, because of anatomical differences between the upper and lower jaws. 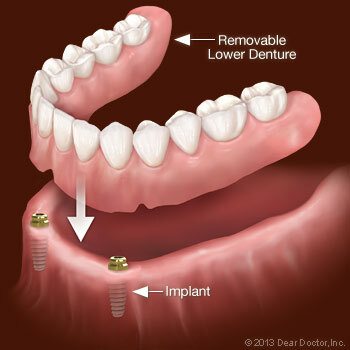 If you already wear a denture, we may be able to modify it to become an implant-supported denture. Or we will have a new one made for you. Dental implant surgery is a simple, routine procedure carried out in the dental office under local anesthesia in most cases. After numbing the area, an appropriate number of implants will be placed in your jaw at precisely planned angles and positions to maximize support and avoid anatomical structures such as nerves and sinuses. Depending on how many implants you will need, the surgery can take anywhere from one to three hours. Most people who have dental implants placed find that any post-operative discomfort can be managed with over-the-counter anti-inflammatory medication such as ibuprofen or acetaminophen. After surgery, your implants will need to complete the process of fusing to your jawbone (known as osseointegration), before they can support your denture(s). This takes at least six weeks and is different for everyone. During this healing period you will not be without teeth, however, because you can wear a denture that is modified so that it does not overstress the implants. When healing is complete, we will show you how to hook your denture onto the supporting implants (and take it off again) so you can experience the security of teeth that don't move — and all the benefits that go along with them.